As part of my new job, I get to assist my good friend in hosting the occasional ELL (English Language Learner) Family Night. For such an event we make sure to offer a complete meal to guests as well as helpful information for acquiring language and adjusting to a new culture. For the first family night, we served up large sub sandwiches courtesy of Wal-Mart and ended up bringing home more than a few containers of perfectly sliced, red onions. And while red onions are delicious on their own, they have an aroma which permeates all things and the upstairs kitchen was beginning to take on a rather foul odor. So, I went to work and did what I do best, preserve them suckers! A quick internet search revealed a 1988 New York Time's recipe for Red Onion Preserves. 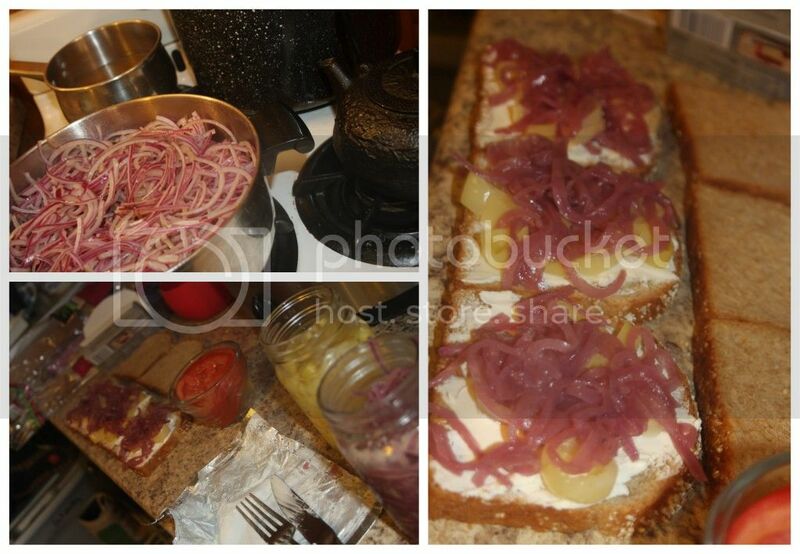 The only thing the original recipe lacks are pictures, so above you have a photo of the delicious, and I mean DELICIOUS, little onion slices and below, you'll find the recipe (in case you have an aversion to clicking on links). Peel and slice 6-7 red onions, cut in half, you'll need about 8 cups total. Heat 2 Tbsp. of butter in a heavy kettle and add the onions, 1/4 tsp. Allspice, 1 bay leaf and 1 tsp. finely grated Ginger. Cook and stir often for about 10 minutes. Stir in 3 Tbsp. Honey and 1/4 cup Red-Wine or Malt Vinegar. Cook, stirring often, for an additional 5 minutes. Let preserves cool and store in a tightly covered container for as long as you can go without eating them! They're great warmed up with meats and in omelets or as a sandwich condiment. What use will you find for Red Onion Preserves?